Sometimes we don't even need to leave the office to see some thing interesting. We lean out the window. Most likely, you've seen this old black and white cruising around town before, but it caught my eye as I turned onto Center Street, so I stopped to snap a pic. 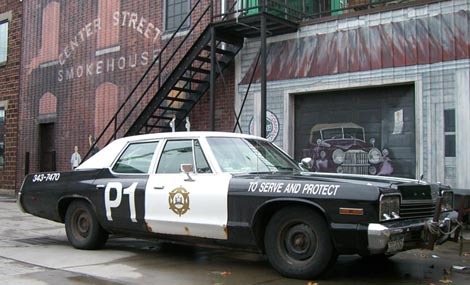 Nope, Adam-12 didn't suddenly turn up in town. It belongs to Center Street Smokehouse. posted by Howard B. Owens in batavia, fire. 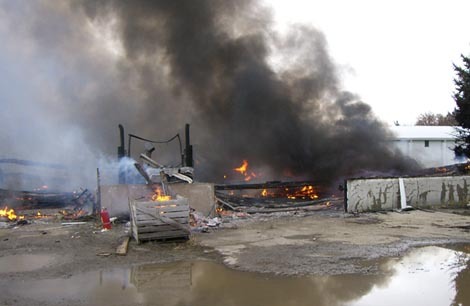 posted by Howard B. Owens in batavia, fire, My T Acres. UPDATE 10:54 a.m.: The fire is at 8127 Lewiston Rd. in Batavia. 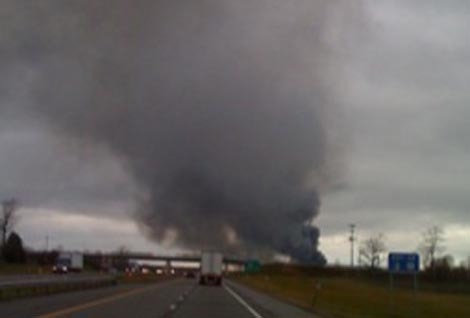 A large plume of black smoke can be seen drifting over the city of Batavia. UPDATE: 11:17 a.m. We're at the scene (after a long walk because State Troopers wouldn't let us drive in). 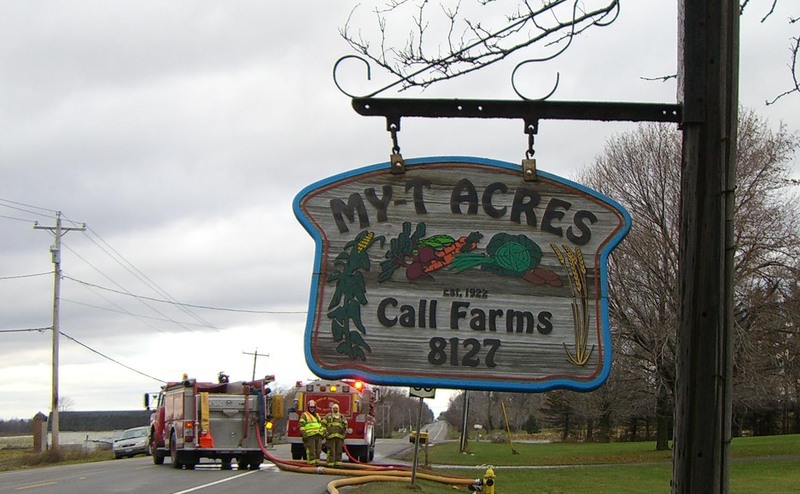 Owner of the property Pat Riner says they noticed a small flame coming from one of the barns and the fire spread quickly. A silo appears to have fallen. UPDATE: After the flames and smoke cleared, I decided what looked like the ribs of a silo were just part of the barn that had been fully engulfed. The facility is My-T acres. Witnesses said they heard explosions. 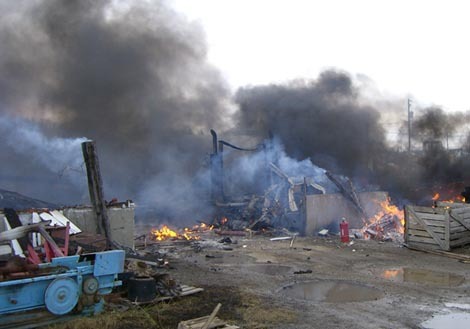 Riner said the explosions where mostly truck engines. 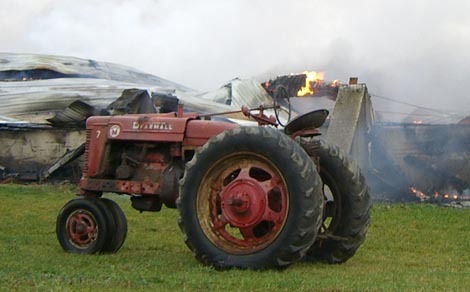 The barn that caught fire was full of harvester equipment, "because the harvest is over." She said. 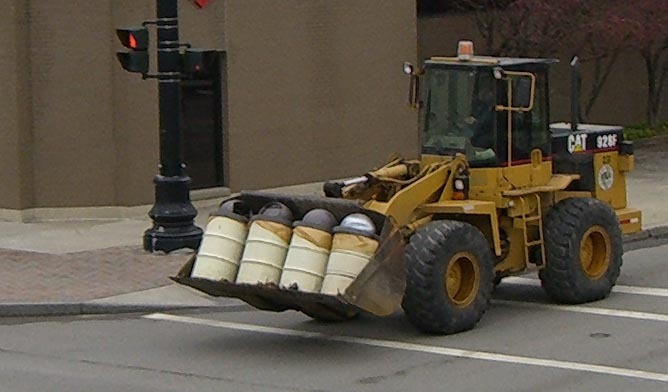 Also, a truck was full of ferilizer for next year. The structure is adjacent ot a barn that Riner described as a sports facility used by many athletes in Batavia. As we post now, the fire is spreading to that structures while crews battle the flames from atop two ladder trucks, spraying water down onto the flames. We should have a quick video posted in 30 to 60 minutes. Philip Anselmo will follow up with more reports once he's on scene. 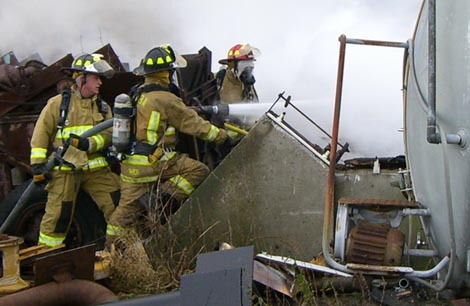 UPDATE: 11:29 a.m.: Crews put additonal hoses on the sprots-structure fire. The fire seems well tapped down at that end of the building now. I'd estimate about 15 to 20 percent of the structure was lost. UPDATE 11:52 a.m. : Here's a quick video from the scene. 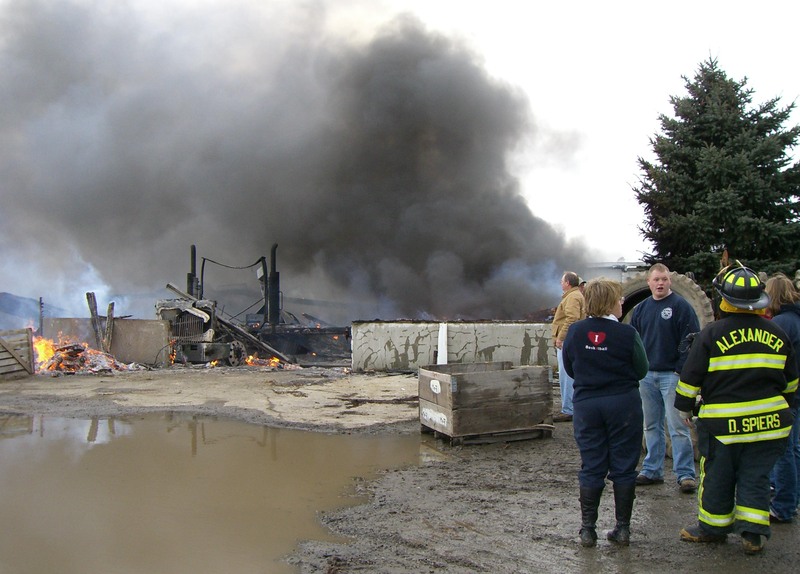 UPDATE 12:08 p.m.: Spoke with Genesee County Emergency Management Coordinator Timothy Yaeger briefly. No loss of life. No injuries. No animals known to be involved. About 12 companies responded. Flames can still be seen in an around the structure, but the fire appears to be under control. UPDATE 2:31 p.m.: The fire is under control and nearly extinquished. Some of the companies that responded are now back in service. Below is one of the pictures from the scene. More can be viewed here. UPDATE: If you were at the scene and took pictures, or took pictures of the plume over Batavia, please upload them in a blog post or send us a link to where ever you posted your shots. Here's a camera phone shot taken from the Thruway. 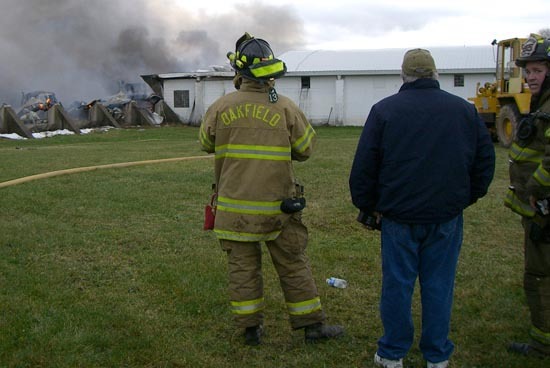 FIRST POST 10:40 a.m.: We've received reports of a large barn fire in Pembroke Batavia. Multiple units responding, from as far away and LeRoy. We'll head out to the scene now. posted by Brian Hillabush in batavia, basketball, sports. Batavia grad Mike Hoy is a freshman on the Geneseo men's basketball team, and he witnessed an amazing shot last night by one of his teammates. Scott Morton hit a crazy shot with 1/10 of a second left to go to give Geneseo the 85-84 win over Oswego State. Hoy was held scoreless in 15 minutes of play, but did hand out two assists. The shot earned the top spot on ESPN's top plays today. You just have to see the video on this one (followed by an interview with Morton). If Batavia could get that one big project, funded by the Fed... what would it be? posted by Philip Anselmo in batavia, business, economy. An article in the Buffalo News this morning got me thinking. Briefly, the article is about Robert Wilmers, chief executive officer of M&T Bank Corp. Wilmers spoke to an audience of venture capitalists about revitalizing the upstate economy. He pointed out that New York City’s economy — until recently — had been doing "a lot better than the economy upstate." Part of that is due to what he called the "innate attributes" of the city itself, but he also cited the "billions and billions of dollars" spent on projects such as the 42nd Street revival, the South Street Seaport, the Jacob Javits Center and Ground Zero. By contrast, "in upstate, including Western New York, we have not seen any large projects." Indeed, Wilmers said he was told by former downstate Empire State Development chairman Patrick Foye that up to 70 percent of the agency’s money was spent upstate, but "I was having trouble finding that." So this got me thinking. Rochester tried for its home-run project some years back. Who here remembers the fast ferry? Connect Rochester to Toronto. Boost tourism. Bring in the money. Yeah... So, that one tanked. Big. But what about Batavia... what could we do for Batavia that would give it that shot in the arm, get the kids out walking the streets and the old folks dancing in their homes? Money rolling in, fame, glory. We're not on a body of water, so we don't have to worry about a ferry flop. We've already got the "mall" that people love to hate. Batavia has plenty of architecture to show off: glorious old homes, towering brick churches, regal crumbling mansions. So... We had the chance to ask Pat Weissend what he would want for Batavia. Weissend is the director of the Holland Land Office Museum. He says, why not think even bigger. Something huge, something humungous! At a recent meeting of the Kiwanis Club, Weissend heard a presentation by economic developer Chad Zambito about erecting an enormous technological-industrial park in Alabama. This industrial center would create 10,000 jobs and entirely transform the character of the region, says Weissend. Well, either that, or establish the state of Genesee. "We could be the 51st state," he says. Just make sure there's enough money left over to triple the size of the museum. Looking for a Lost Poodle! posted by Philip Anselmo in batavia, Announcements, lost pet. MY YORIE-POO LITTLE 7LBS ALL BLACK DOG HAS BEEN MISSING FOR ALITTLE OVER A WEEK NOW AND i AM OFFERING A $500.00 REWARD FOR HER SAFE RETURN. SHE WAS LAST SEEN NEAR SOUTH MAIN ST AND FAIRWAY DRIVE. SHE WAS WEARING A PINK HARNESS. PLEASE IF ANYONE KNOWS WERE SHE IS YOU COULD CONTACT ME AT 585-409-8603 OR 585-345-1552.THANK YOU! posted by Robin Walters in batavia, community. Alright, so maybe they were not fresh out of mom’s oven, but they sure did bring great comfort and smiles to the students we delivered them to. What is that you ask? The Care-A- Van team headed out to the local college dorms this evening. The bus was overflowing with boxes of cookies. I can still hear Elder Ron’s voice booming throughout the halls. As he knocked his strong voice echoed through the halls-“Care-A-Van Ministries here.” One team took one side of the building and the other team took the other side. As the doors opened, we let them know that we were there because we cared. We shared a brochure of the ministry, a Thanksgiving gospel track and a big box of cookies with each room. Many answered their doors with their cell phones attached to their ear. Several of the rooms were busy cooking dinner. We tried to guess at one room what they were having. Paul of course chimed in with his guess of Ramen Noodles. How many of you remember those college days when you lived on ramen noodles served with a peanut butter and jelly sandwich? Paul became quite the barter with the boxes of cookies. He even tried to trade the box of cookies for a bike that sat in the living room. At the last door, two young men opened the door. The one had a cooking utensil in his hand. This room was blessed with a chef! They were cooking chicken wings. We tried to ask them what time dinner would be ready and that we would stop back. I think the classic of the night is when this young woman answered the knock. I explained that we were there because we cared and had a special gift for them. I turned around to allow Paul and Shawn to present the cookies. Well, it was not cookies that Paul had in his hand. He stood there with an old sink he found sitting in the hall! The most touching knock came at an apartment filled with young men. As we turned around to leave, the young gentleman named Matt asked if we could pray with him. He had gotten a call from his father that his mom had to have surgery. Talk about a blessed moment! We prayed and asked for healing for his mom and for the Lord to strengthen him and give him comfort and support while he was miles away from his family. The whole scene touched my heart. Here was a young man who was miles from home and needed comfort. As we walked away, I silently prayed that the other young men sitting in the room heard our prayer as well. We had a special young girl that came out with her dad to help deliver the cookies. Sarah is such a pretty little girl. Here was a young gal that one day whose future may find her miles from home in a similar situation as these college students. Her father is helping build her foundation of the love of Christ and how that love can be shared. To often in life we get caught up in the busyness of our daily lives. How refreshing it was to take an evening and share some comfort with these young folks. As we presented the cookies, many of the students would reach in to take just one package. We explained they got the whole box. “Really?” many of them said as their eyes met ours. “Yes, really we replied”. The thought that comes to my mind is that God’s gift for us is the whole package. He readily offers to us the whole package of salvation. Not just a piece, not just a part but all the promises and gifts that come with turning our lives and hearts to him. Now that my dear folks is priceless! Just as those cookies were free tonight, so is our salvation. Just as the company that sent the cookies to our ministry to share, God sent his son to share with each and every one of us. Praises to Creative Creations for their donation and praises to our Lord Jesus who gave his life for us. posted by Philip Anselmo in batavia, business, GCC, entrepreneur. Beginning this January, Genesee Community College will host a pair of related courses for three successive semesters on "Exploring Business Opportunities" and "Entrepreneurship." Associate Professor Barbara Shine welcomes innovators large and small. If you've got the sure-fire idea for the next big thing, you're welcome. If you're not sure what you want to do, but you know you've got the gumption, you're welcome, too. As for the best news: it's free, and anyone can attend the courses. College students. Retirees. Workers. Anyone. Just be sure to get your application in by January 15 to be considered for this coming semester. (Scroll down to the end of the post for all the details). The Batavian: Much has been made in advance of the courses about the rough economy and this being, in fact, a great time for entrepreneurs. In the press release sent out by the college, for example, we read: "With the unemployment rate at 6.5% and expected to climb higher, entrepreneurs and energetic American inventors and innovators are an essential element in the recovery of the nation's economy." Can you explain why that is the case? Barb Shine: Well, we know, because of the employment world, that small businesses hire more people than the total who work for large corporations. That's where the opportunities are. We as entrepreneurial educators need to remind folks from an economic standpoint that it's the small businesses that raise the opportunities to support our communities from an economic standpoint. However, small businesses may have a poor track record of staying in business for a long time. But that is where we as educators can help out. There are a lot of places for entrepreneurs to get education. What advice might you have for folks who may be considering going into business for themselves? What should they consider at the outset? First, you need to verify that the market is interested in your concept. I call them concepts. You need to do market research. Find out what alternatives are out there for a consumer. Find out how does your product differentiate itself. Those questions need to be answered. Also, the market has to be big enough to be profitable for the individual. So you look at marketing, first, then financial feasibility, then operations. One of the beauties of the course is that we will tell people what's out there, what the market will bear from a trend standpoint. People need to understand that (doing) what we're passionate about and making it work in the marketplace can be two different things. An entrepreneur needs to always be looking out for the next best thing. You do this by social networking, reading the magazines, looking at the competition—and not necessarily the logical competitors. Who would have thought that the customer service style for Disney would work in a bank? In fact, Disney sells their customer service package to large financial institutions. What will each class entail? Do people need to attend both? Can they attend one and not the other? In the first class, "Exploring Business Opportunities," the questions that should get answered include: Do I have the right concept that the market would be interested in? Am I passionate enough? Because it requires lots of energy, time, money. Do I have what it takes? What do I need to think about from marketing, operations and financial standpoints? Then we need to verify that there is a market, make sure there is enough of a popoluation and buyers. In the second class, "Entrepreneurship," we will put a plan together. This class qualifies the details of what I need to do to make it happen. It's the five P's: proper planning prevents poor performance. The goal is to plan... And assuming they need funding, they will use that plan to support loan or investor options. In most cases, folks do bootstrapping entrepreneurship: That's where funding is minimal: from family, savings, second mortgage—they bootstrap it if they can. How are things looking right now as far as loan options? It depends on how much money an individual is looking for, their personal credit line. Do I think it's at a standstill because of the credit crisis: No. The basics are still important. There are other alternatives aside from banks, other investor opportunities. Personality, their own financial background—there's an array of variables. An entrepreneur shouldn't be deterred if they have a great idea and there's a market... but they need to come to the table with the right plan to turn their business into a profitable entity. Shine also spoke about specific trends that are hot right now on the market. They include: green energy, organic foods, Web applications, and alternative energy solutions. In fact, the December issue of Entrepreneur magazine is devoted to the upcoming trends and might be a good read for those considering taking the courses and testing the waters with their own idea. The Genesee Community College scholarship program is part of the collaborative WIRED (Workforce Innovation in Regional Economic Development) grant, wherein eligible participants will be reimbursed for the cost of tuition and books for two college entrepreneurship courses offered in this coming Spring, Summer and Fall of 2009. The scholarship grants are valued at approximately $500 per semester for enrolling and completing Business 111: Exploring Business Opportunities; and Business 225: Entrepreneurship. Interested individuals should submit the scholarship application form and related materials as soon as possible. The application deadline for the Spring 2009 semester is January 15th. Women and minorities are strongly encouraged to apply. Scholarship awardees will be notified prior to the start of each course. For more information on the program or to get a copy of the scholarship application, visit the college's Web site. The Young Entrepreneurs Academy is a program for middle and high school students that teaches them how to launch and run their very own business. Mentors will have the opportunity to assist their student group in the process of developing and writing a business plan and creating an investor presentation used to request funding. We also encourage mentors to share their business experiences with the groups over the course of their meetings. Previous students have indicated that hearing first-hand accounts from members of the business community make a significant impact on what they are learning. Visit the program's Web site for more information. 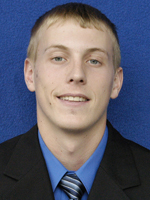 Batavia grad Kevin Saunders is the male Athlete of the Week at Fredonia State after a huge game against D'Youville. The junior guard poured in 14 points with five rebounds in a 66-44 win over D'Youville. He also hit 4-of-7 3-point attempts and dished out two assists. Fredonia held former Oakfield-Alabama star James Davis - a freshman at D'Youville - scoreless in that game. Davis did have a block, a rebound and an assist in the contest. The Blue Devils are 5-1 after beating Pitt-Bradford 84-79 last night. posted by Amy Johnson in batavia, Announcements, Notre Dame. Notre Dame High School will present its annual Holiday Pops dinner and concert on Sunday, December 7, 2008. The evening will begin with dinner at 6:00 p.m. followed by special holiday performances from Notre Dame students in the Jazz Ensemble, Concert Choir and Concert Band. The musical program will feature Lowell Mason’s Jazz to the World, Franz Gruber’s Silent Night, Leroy Anderson’s Sleigh Ride as well as other holiday favorites including O Holy Night, You’re a Mean One Mr. Grinch and What Child Is This?. Tickets are pre-sale only and are $20 per person; tables of eight are available. Reservations may be made in-person at Notre Dame High School located at 73 Union Street or by calling (585) 343-2798 no later than Wednesday, December 3. Notre Dame High School is a Catholic co-educational institution dedicated to educating and preparing young men and women to lead and serve in an ever-changing world. Founded in 1951, Notre Dame challenges students by providing the highest level of academic programs, offering extensive co-curricular activities and embracing a commitment to serve humanity. posted by Brian Hillabush in batavia, basketball, sports, Notre Dame. When you look at the Notre Dame roster, the name Kevin Francis easily stands out. The senior point guard has been one of the top players in the Genesee Region League over the last two seasons and was a GR all-star last year, pouring in 16.5 points with 5.8 rebounds, 6.2 assists and 5.1 steals per game. He dropped in 18 3-pointers. There is no question that he is going to be the leader on the off the floor. He had an established, solid supporting cast last season as the Fighting Irish, and the squad went 18-5 and earned the top seed in the Section 5 Class DD playoffs. ND ran into Elba in the semifinals and the Lancers came from 12 points back and sprung a 64-58 upset. But gone are the likes of Christian Bochicchio, Joe Pawlak, Pat Mancuso and Mark Fanton. Instead, a strong group of youngsters will be taking the court to support Francis and try and get ND a sectional title. There aren't a lot of returning scorers and you can expect junior Matt Thompson and sophomore Vinny Zambito to be major factors on the offensive end. Thompson is a pure shooter and Zambito is a scoring machine that led the jayvee squad a year ago. Senior guard Kevin Schildwaster will also look to score. Backing up Francis will be junior Nick Bochicchio, who played quarterback on the football team and has the ability to lead things on the court when Francis needs a rest. While Fanton was a true big-man for the Fighting Irish last year, standing 6-foot-6 and weighing 215 pounds, Notre Dame doesn't have anybody that can match his size. But they might even be more physical in the paint. Senior Rick Lair is also 6-2 and weighs 185 pounds, but is a strong player that was a solid player on the football team. Senior Nick Weatherwax is the biggest player on the squad at 6-3 and is also physical. A lot was made out of coach Mike Rapone's 500th victory last season, rightfully so, but this group doesn't have the pressure of trying to win that game for the legendary coach. 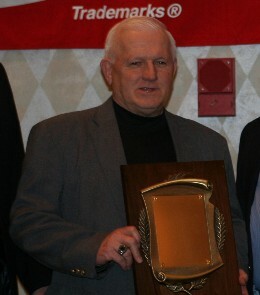 Rapone became just the third coach in Section 5 history to get to the 500 win plateau (Jim Burke of Prattsburgh won No. 500 in the season opener this year) when Notre Dame beat Kendall midway through the season. His current record is 509-133 and he is chasing Ed Nietopski of Bishop Kearney and Cardinal Mooney, who is the all-time leader with 545 victories. He has an outside chance of catching Scio legend Roger Bigby this season, as he ended his career with 527 wins. In 29 years, Rapone has won 26 division titles, seven Section 5 titles, four Far West Regional championships and two state titles, with the last coming in 2001. Rapone usually gets the most out of what he has, and this year's version of the Fighting Irish have a lot of talent. It is only a matter of getting the young players to mesh with the veterans and contribute with scoring. posted by Brian Hillabush in batavia, sports. We have very exciting news here at The Batavian. Mancuso Bowling Center will now be posting league bowling scores, starting soon, as manager Mike Sputore will be contributing league scores to The Batavian. Batavia has some great bowlers and The Batavian will now be the place to go in order to see your scores in a timely and accurate fashion. You will also be seeing some features and highlights from the bigger tournaments throughout the winter. Leagues bowl at Mancuso's on Monday, Tuesday, Wednesday and Thursday night as well as Monday and Friday mornings, and every-other-Saturday. Please check for updates each night, or early the next morning if you aren't a night person, starting tonight. Also, if any other area bowling leagues would like to post scores on The Batavian, please contact myself at brian (at) thebatavian (dot) com for information on how to do this. posted by Philip Anselmo in batavia, curiosities. Driving through downtown Batavia earlier today, I spotted a curious motor vehicle parked out front of a home on North Street, just east of Bank Street. In fact, it so caught my attention that I turned around at Dwyer Stadium and drove back just to take its picture. 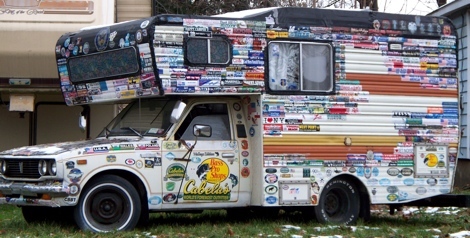 One need catch only a mere glimpse of this truck to be dazzled, and that's without even knowing what splendors might be tucked away in its spacious cab—itself retro-embellished with umber stripes that can still be somewhat discerned beneath the cacophony of stickers. And oh, such stickers! It's probably impossible to see in these couple of photos here, but the stickers are no less than a paean to our American identity, albeit one that leans to the right. From "Fishaholic" and "Semper Fi" to "Let Freedom Ring" and "God Bless Ronald Reagan" (yikes), they are a testament to the wonder and ubiquity of American products, presidents, pastimes and... branches of the military. Yet this truck has more to recommend than carpet cleaners (you might be able to make out the "Castle" sticker to the right and near the bottom of the window). It tells a story, some of which we can decipher from the few superficial clues we have here. We may infer, for example, that the owner is a traveller who once served in the military and enjoys the sport of fishing. 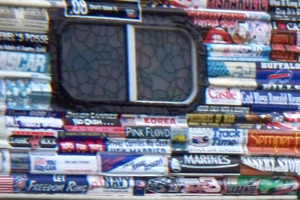 This truck is an enormous symbol of self decked out in hundreds of smaller symbols that sharped the bigger picture we get in the first glance. In addition to the United States sticker, the hood also bears one for Wales and another for Poland. Are these indicatiors of ancestral nationality or places the owner visited? What of the stained-glass windows above the windshield and doors? Are they symbols of a religious sentiment or merely decorative? How would you imagine the owner of this truck? Perhaps... A middle-aged fellow. A bit grizzled. A bit gray. Laughs heartily. Eats beef jerky. Doesn't mind if he gets lost, although he likely never does, having travelled coast to coast to coast, and back again. What do you think? Do you know this truck? Is it your truck? Can you tell its story? posted by Philip Anselmo in batavia, wbta, business, Loose Ends. A Batavia business mainstay for more than a century, Loose Ends Vending & Food Service, has been sold, according to WBTA's Dan Fischer. A Massachusetts company will take over the vending service and incorporate it into "the nation's largest vending company," Next Generation, which operates out of Canton. 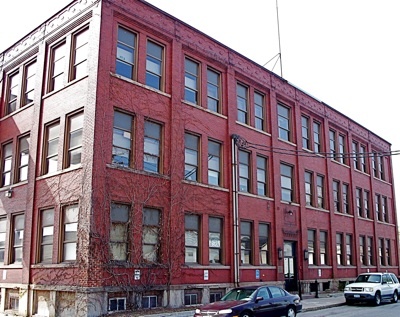 Fischer reports that: "Many Batavia workers will be transferred to the new company's offices and warehouses in Buffalo and Rochester." No mention of how many workers will be affected, or if any stand to lose their jobs. Loose Ends was owned by brothers Thomas and John Houseknecht, along with their brother-in-law William Barton and nephew Michael Houseknecht. The family also owned the Pepsi-Cola Batavia Bottling Corp., which was sold nine months ago to the Pepsi Bottling Group. Multiple accidents on the Thruway eastbound near Pembroke kept the highway closed down and backed up for nearly 20 miles yesterday evening. Slick wet roads are likely to blame for the crashes. 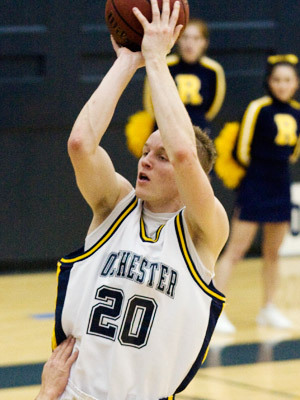 Batavia grad Mike Chmielowiec had some key baskets and earned tournament MVP honors as University of Rochester beat Lycoming College 63-59 in the finals of the UR/Holiday Inn Airport Invitational Sunday night. Chmielowiec hit two free throws and a layup to turn a 1-point lead into a 5-point lead with just less than four minutes left in the game. He ended up scoring 16 points with eight rebounds to lead Rochester, which improves to 4-1. It is the second tournament of the season for the Yellowjackets, who lost to Ithaca in the finals of the Chuck Resler Tournament. Chmielowiec - a senior - made the all-tournament team in that one. Chmielowiec is leading UofR in scoring at 21 points per game and rebounding with 6.4 boards per game. posted by Brian Hillabush in batavia, basketball, sports, Notre Dame, hockey. The Notre Dame hockey team had both offense and solid goalkeeping to start the season off with a 5-1 win over Bishop Kearney/Eastridge. Ivan Madaferi, Jason Harasimowicz and Dylan Versage had a goal and an assist each with Jack Nenni and Sean Kota adding a gal apiece. Thomas Dehr had 15 saves in net. Riley Austin had the lone goal for the Kings (0-2). The Pembroke boys basketball team evened up at 1-1 in getting a huge performance by Andy Gabbey. The guard drained nine 3-pointers to score a game-high 32 points as the Dragons thumped Williamson 64-46. Andrew Wright scored 13 points and Ken Babcock pitched in 11. Caleb Burlee scored 20 points for Williamson (0-2). The Blue Devils trailed by 18 points at one point, but cut the deficit to six points with just over a minute left and went on to beat Warsaw 54-46 in the consolation game of the Warsaw Tournament. Tate Westermeier had 15 points and Matt Sheffield added 11 for Attica (1-1)..
Holden Case had 14 points and seven boards for Warsaw (0-2). Livonia jumped out to a 34-10 halftime lead and rolled to a 71-25 thumping of Alexander in the consolation game of the Alexander tournament. Ryan Metz outscored the Trojans on his own, pouring in 14 of his game-high 26 points in the first half for Livonia (1-1). Jared Quinn and Troy Shelnut had five points apiece for the Trojans (0-2). Wheatland-Chili won all four quarters, including a 20-4 run in the third quarter en route to a 65-36 victory over West Seneca in the consolation game of the Northstar Tournament. Ricky Agosto (14 points), Andy Lund (13), Garhett Varin (12) and Evan Price (11) were all in double figures for the Wildcats, who improve to 1-1. Lund had 11 rebounds and Agosto added six. Dylan Patterson had 17 points for West Seneca, out of Section 6.
posted by Brian Hillabush in batavia, Attica, basketball, sports. No team plays perfect basketball at the start of the season. The Batavia girls definitely were not at their best Saturday night in the finals of the Attica Tip-off Tournament, but overcame some issues in the paint and defeated Dansville 59-49 to capture the championship. The Blue Devils opened up a seven point lead in the first quarter as Brittany Mazurkiewicz had the hot hand. The senior guard scored 11 of her team-high 19 points in the opening frame, giving Batavia an 18-11 advantage. But Dansville came back and trailed just 24-20 at the half because of a solid effort in the paint. Batavia struggled to hit layups and gave the Mustangs too many second-chance points in the period. Margaret Infantino's 3-pointer in the closing moments brought her team to within four points going into the break. After Infantino dropped in another trifecta early on in the second half, Dansville took a 25-24 lead on a Ryan Doerr bucket. Infantino hit another 3-pointer after Michelle Jordan scored for Batavia and Dansville had a 28-26 lead, the team's biggest of the game. Infantino scored seven of her game-high 20 points in the third quarter and the Mustangs led 36-35 after three periods of play. Kristen Klein scored three points near the end of the third quarter and took over early in the fourth. The 5-foot-9 junior was one of several Batavia players looking to be a strong option at forward, next to Jaycee Shirk, and she very well could be. Klein had several fourth quarter rebounds and scored her other four points in the fourth, with the second basket putting Batavia up 45-36. In all, Batavia scored the first 10 points of the final period. Dansville cut the deficit to four points with just over 3 minutes left, but Mazurkiewicz hit a free throw, Stacy Hein ht a pair and Shirk scored to make it 50-41 with less than two minutes to play. Hein hit 8-of-8 foul shots in the last minute and finished with 13 points. Mazurkiewicz won the tournament MVP as she finished with 19 points, five assists and four steals. Shirk made the all-tournament team with eight points and four blocks and Jordan pitched in six points. Infantino made the all-tournament team with 20 points and was joined by Ashley Amidon, who scored eight points. Dansville falls to 1-1 while Batavia and new coach Bill Wade improve to 2-0 and bring home the championship trophy. Alexander's Rachel Pettys made the all-tournament team as her Trojans beat rival Attica 44-32 in the consolation game. She scored 11 points with 13 steals and seven boards. Anna Dominick poured in 15 points with Kate Kochmanski grabbing 13 boards to go with her five points. Attica's Christina West had 10 points and made the all-tournament squad. 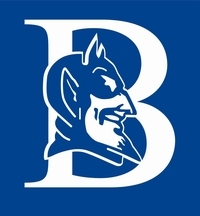 The Blue Devils fall to 0-2 while Alexander improves to 1-1.
posted by Brian Hillabush in batavia, basketball, sports, alexander, pembroke. The Batavia girls basketball team is already feeling the impact of hiring Bill Wade. The Blue Devils were down 22-14 at halftime, but went on a 12-0 run in the third quarter and went on to beat Alexander 57-48 in the opening round of the Attica Tournament Friday. Brittany Mazurkiewicz scored all 16 of her points in the second half and Jaycee Shirk pitched in 19 points with 10 rebounds, five steals and three blocks. Mazurkiewicz also dished out five dimes and had six steals. Brittany Wormley and Kristen Klein added six points apiece for the Blue Devils (1-0), who will play Dansville in the finals. Anna Dominick had 16 points to pace the Trojans (0-1), with Chelsea Turcer adding 11 points and Rachel Pettys finishing with 10. The Mustangs (1-0) advance to play Batavia after thumping host Attica 55-25. Ashley Amidon led the way with 17 points, with Margaret Infantino pitching in 14. Jackie Algiers scored seven points to lead the Blue Devils (0-1). The finals are at 7:30 p.m. Saturday. The Pembroke boys opened up with a non-leaguer against host Penn Yan and fell short, losing 57-54. The Dragons got big games from stars Ken Babcock and Andrew Wright, but not much else. Wright had 23 points with seven boards and Babcock poured in 21 points with nine rebounds, but the only other players to score were Kyle Stocking (7 points) and Andy Gabbey (3). James Wilson led Penn Yan (1-0) with 18 points and 13 boards. Prattsburgh coaching legend Jim Burke knew victory No. 500 was going to come at a point, probably sooner than later. His Viking squad overcame a tough Whitesville squad and got their coach that historic win with a 57-48 victory Friday night in the opening round of the Honeoye Holiday Classic. "One reason why we are happy is that it puts us in the championship game tomorrow," said Burke, who now has a career record of 500-155. That was in the front of our minds. It was awesome because there were so many people here from Prattsburgh and there was a (celebration) afterwards. It was pretty awesome." Whitesville only has eight players on the roster, but gave Prattsburgh everything they could handle, and the Vikings needed a big third quarter run to pull out the victory. Burke and his team ended last season with a loss to Northstar Christian in the Class D finals, leaving him one win short of the milestone. "What bothered us most last year was losing, not, not getting 500," said Burke, who is good friends with Notre Dame coach Mike Rapone, and even beat him when Rapone was at win No. 499 last season. "If you come back, you know you will win one more. It was tough for the kids with the great work ethic last year that didn't get a patch. That was the worst part of it." When you have 500 wins, you have a lot of career highlights. Burke lists his top highlight as the 1991 season, when the Vikings went 29-0 and won the state title. Prattsburgh will be playing Honeoye in tomorrow's championship game. Honeoye beat Genesee Valley 52-50 in the opening round. "The weight is gone, especially for the kids" Burke said. "They had a card made up and everything before the game, so you know it was on their minds. It wasn't just the kids, but the community. They feel it and were talking about it. I'm so glad to get it off our shoulders so we can just go play." Burke is not ready to commit to another year after this one, but if this is it would go out as one of the top coaches in Section 5 history. "I will probably have some thinking to do over the summer," Burke said. "But it is getting close to the end. I'll know at the end of the season. There are a lot of factors involved."